Ghost Gully Produce is a family owned and operated hydroponic lettuce and herb farm in the heart of the Lockyer Valley. We pride ourselves in producing a superior product which is hand harvested, packed and delivered fresh from Brisbane to Toowoomba in our refrigerated van. Our product is quality assured with HACCP Certification to guarantee excellent produce, and is consistently awarded Grand Champion at the district show in the categories Collection of Lettuce for Salad, Herbs, Distinctive Herbs and Three Lettuce. The use of cutting edge technology at Ghost Gully Produce has enabled us to become more efficient and sustainable farmers. We grow pesticide free and with sustainable organic elements. 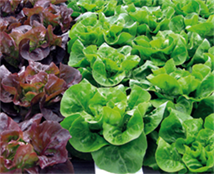 All salad lines are washed in ozone treated water, which promotes longer shelf-life and leaves no residue.